In Australian media news this week, mX smells like a strawberry sundae, Ipsos Media CT launches a new measurement system for content brands, Shop Til You Drop goes quarterly and how Tinder’s owners plan to monetise the dating app. 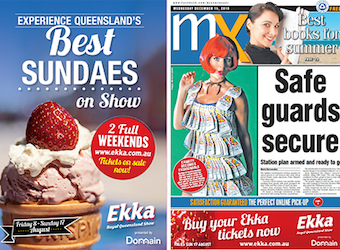 Brisbane’s afternoon newspaper mX has utilised NewsScent technology to create a special edition scented like strawberry sundae to celebrate The Royal Queensland Show, Ekka. The company said in a statement that the “visually powerful” scented advertising wrap aimed to create buzz and get people talking. NewsScent technology involves spraying the particular scent onto the pages of the newspaper during the printing process. Brisbane mX distributors last Tuesday handed out the wrap wearing hot pink co-branded T-shirts. Ipsos has announced the launch of PLSme!, a unique research approach specifically developed for media and content brands to better understand audience behaviour, engagement and monetisation opportunities. The PLSme! approach takes into account that media consumption behaviour needs to be measured differently from traditional consumer products because of the unique connections that they have with consumers. PLSme! has three measures that assess the depth and nature of the consumer journey with these brands, they are called Pick Me!, Share Me! and Love Me!. Pick Me! diagnoses the stand out factor and appeal of media and content brands; Love Me! diagnoses consumer engagement with those brands and Share Me! uses the diagnosis to build successful monetisation strategies around areas such as social media, apps and subscriptions. “PLSme! is a world first research tool in that it brings together a multi-layered solution for media and content brands that have their own set of unique consumer behaviours,” Ipsos MediaCT Executive Director Kirsten Riolo said. Australian Associated Press (AAP) has acquired Crown Content’s directories and media contacts business. AAP has purchased Crown Content’s stable of seven directories, including online and printed brands such as Margaret Gee’s Media Guide, The National Guide to Government and Who’s Who in Australia. The business will be incorporated into the AAP Medianet business, with synergies expected through integrated management, sales and production. AAP chief executive officer Bruce Davidson said the acquisition would further strengthen Medianet’s product suite and consolidate its position as the market leader in media release distribution and media contacts. Who’s Who in Australia (first published in 1906) is regarded as the authoritative reference to notable people in Australia. AAP will also publish Who’s Who in Business and Who’s Who of Women in Australia. Bauer Media has dropped the frequency of its magazine Shop Til You Drop from fortnightly to quarterly following the recent launch of its online property. The company said in a statement that the changes would capitalise on the title’s fast growing digital audience. A seasonal fashion report will replace the fortnightly magazine, sitting aside regular Shop Til You Drop branded pages across various other Bauer Media titles. “The quarterly publication will become the definitive trends bible showcasing the latest fashions, accessories, designers and style setters from around the globe,” the statement said. Dating app Tinder could generate up to $75 million a year when its owners attempt to monetise it this year. IAC match group chairman Greg Blatt told Bloomberg that the company was planning to make money from Tinder similar to that of sister company OKCupid. The $75 million a year represented potential earnings before interest, taxes, depreciation and amortization, Blatt said. Tinder’s monthly average users have increased 140% this year. The dating app offers users a simple interface to connect with others by swiping “right to like or left to pass”.